Once upon a time, NASA contemplated building an inflatable solar-powered space station. Unlike most early concepts for bringing humans to space, this one made it from concept art all the way to a testable prototype, although it never left the planet. 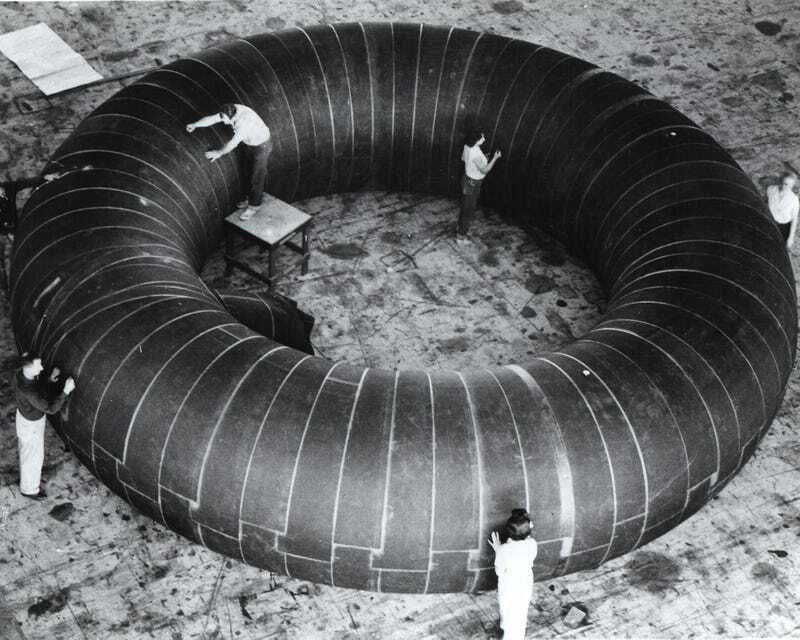 This is a 1961 prototype model an inflatable space station, the Erectable Torus Manned Space Laboratory. The premise was that the station could fit into a small package when being launched from the planet, self-inflating and expanding once it reached orbit. Goodyear Aircraft Corporation designed the inflatable space station concepts in both 9.1 meter (30 foot) and 7.2 meter (24 foot) dimensions. In theory, this was large enough for one to two astronauts to inhabit for extended time periods. The torus shape was selected so the station could spin, giving astronauts artificial gravity between 0 and 1G. Built from lightweight three-ply nylon cord and butyl elastomere, the sticky rubber-like material had an internal fabric bulkhead that could be independently pressurized during emergencies. The station was equipped with a solar collector for power, and yet-to-be-built space shuttles could dock at ports along the outside of the torus. The only problem? An inflatable space station is extremely vulnerable to rips from meteorites (or micrometerites), or even from overly-enthusiastic astronauts bounding around the interior of the donut. From ground tests on a 3 meter (10 foot) diameter prototype, engineers also found the station to be unstable enough that vigorous activity could be enough to induce a wobble in the entire structure. The station was never deployed in space. NASA is currently waiting for the SpaceX Dragon cargo runs to resume in order to test a new Bigelow Aerospace inflatable module for the International Space Station.